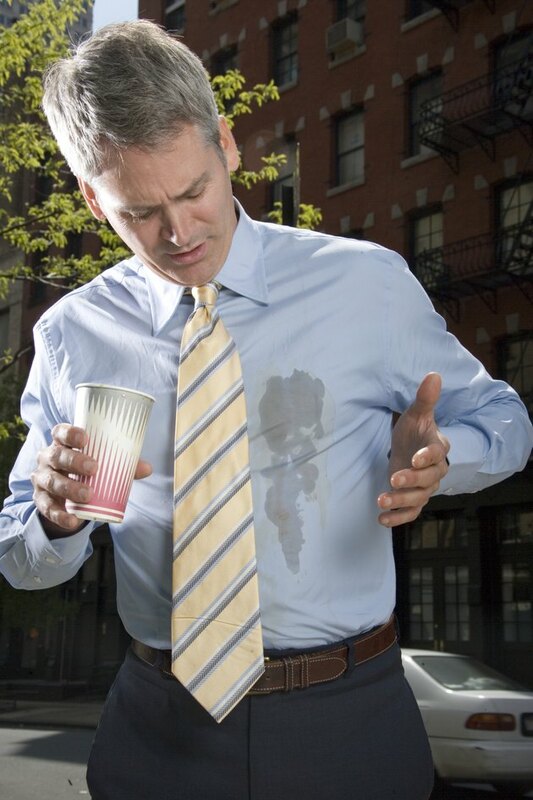 Just because you're dressed in an elegant suit doesn't mean you're immune to inelegant behavior such as general clumsiness and spills. Stains on a suit can instantly ruin the sophisticated tailored appearance, and you'll need to take care of them immediately. Two types of stains are water-based such as juice, blood and perspiration, and oil-based such as salad dressing, butter, chocolate and coffee. Use two different strategies to best address each substance. Time is of the essence when it comes to correcting a stain on a suit. Take off the suit, if possible. Pour a small amount of chilled club soda onto the stain and allow the fibers to absorb it. Dab the stain with a soft, lint-free cloth. As you dab, tap the stain from behind to discourage it from setting. Turn the lint-free cloth over in your hands, folding it to expose a fresh, dry area. Continually turn the cloth so you don't re-stain the fabric on your suit. Pour another small amount of club soda on the stain, watching the fabric absorb the clean liquid. Continue to tap and dab at the stain until it has vanished completely. Remove the suit, if possible. Set a clump of heavy-duty powdered detergent on a paper plate or towel. Dampen the clump of detergent with a few drops of water, mixing with a cotton swab or comparable item. Your goal is to create a slush of wet detergent. Scoop up the detergent slush with clean fingers. Work it into the stain, using the granules of detergent to coax the oily particles out of the fabric. Rinse off the stain with the hottest water you have available, until the fabric runs clean.